Before connecting the MDA’s cables to the computer, first open the Windows Control Panel > Hardware and Sound > Device Manager. In the Device manager, open the section ‘Ports (COM & LPT)’. Next, connect the USB cable from the MDA to the computer. Make a note of which new COM port appears in this list (e.g. COM5). In case you need to double check, simply disconnect and then reconnect the cable; the correct COM port should disappear and reappear from the ports list. Next, in TactileView open File > Print XY Plotter. 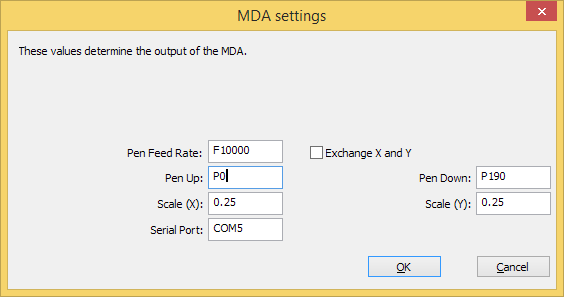 In the dialog that opens up, select the ‘Settings’ button and enter the correct COM port in the settings dialog in the ‘Serial Port’ box.